Agents, or instrumentation modules, capture key metrics at the heart of your applications, exposing their internal workings. The application is not a “black box” anymore, even in Production. In addition if necessary, probes that are placed on the network (appliances) capture application flows transiting between various infrastructure components. The network is no longer a black box either. Dashboards provide real-time performance metrics, for the attention of both operational teams and management. You know if everything is all right, or if performance deteriorates. If problems arise, you are the first to know. A specific Java class, brought by the new version of your website, makes inconsistent use of memory and triggers the garbage collector too often. Solution: optimize this portion of code (which is designated by the APM tool). Some poorly optimized SQL queries allow long-term locks into the database, causing deadlocks and slowing down the website. Solution: optimize these queries (which are designated by the APM tool). A Web Service that you purchase from a third party (eg visitor geolocation, credit card fraud control) exhibits some lags – of course you have not been informed, however you suffer the consequences. Solution: contact the supplier with the evidence provided by the APM tool, and obtain a resolution of the incident. APM therefore guarantees quality of service of your applications or your website, measuring their performance and helping you identify internal causes of deteriorations (root cause analysis) when they occur. In Production, APM can let you anticipate incidents before they impact users, and greatly accelerate their resolution (typically by a factor of 3). 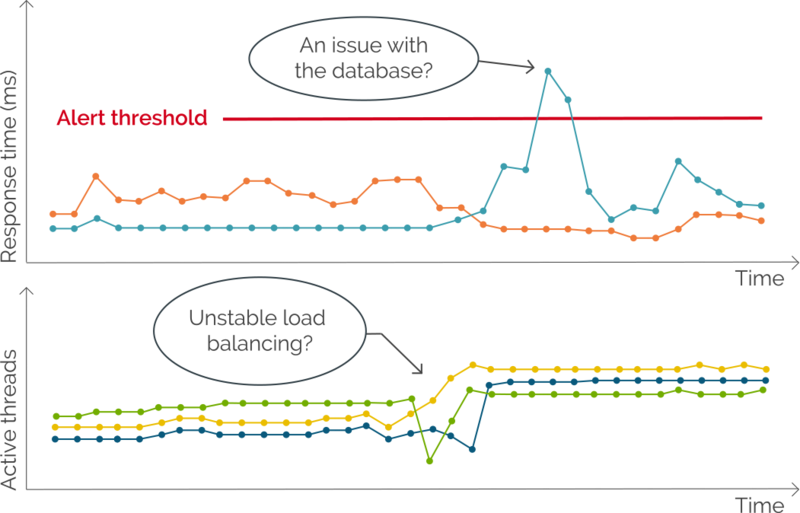 In Acceptance environments, APM identifies the components that cause performance problems and lets you fix them before go-live. Finally, it also identifies performance lags during development of an application. leanovia was able to establish itself as a leading player in the IT performance sector. All our Performance expert consultants are certified and experienced on key APM solutions: Dynatrace, CA APM (Introscope), New Relic, AppDynamics.